An image of our Development Director at the Women’s Day Event with Leesa Eichberger, Sam Santiago, Courtney Conlogue, and Llarisa Abreu. 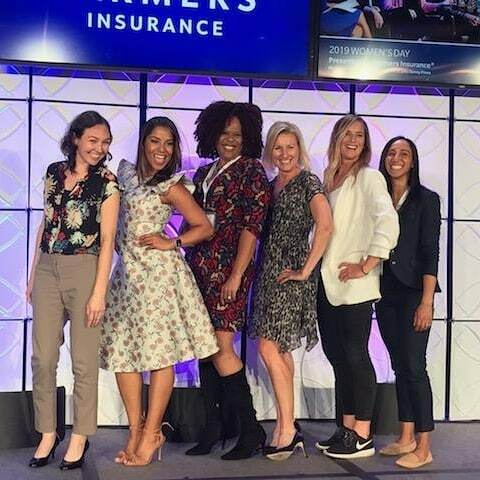 This year, Words Alive was chosen as the Champions for Youth nonprofit organization at the annual Women’s Day Event presented by Farmers Insurance. Farmers Insurance sponsored 500 Kindergarten Readiness Toolkits (backpacks filled with school supplies) for our Family Literacy Program. The 350 participants of Women’s Day volunteered their time to put these toolkits together. I had the privilege of representing Words Alive at this incredible event alongside our Board Chair, Andrea MacDonald. We listened to inspirational stories from women across sectors who have faced challenges as pioneers in their respective fields. As I reflected on the stories from Sam Santiago, Head of Personal Lines Operations Strategy & PMO at Farmers Insurance, and Lorraine Hutchinson, retired from the San Diego Fire-Rescue Department, I realized that often in the nonprofit sector we are seen and see ourselves as “less than.” Less savvy, less educated, less valuable in the grand scheme of things. One of my least favorite pieces of misinformation floating around social media is an image telling people not to donate to certain nonprofits because of how much their CEO makes. I always question why we are expected to do important work with less when we never question the cost of a cup of coffee at Starbucks and how much their CEO makes. After hearing all the panelist’s responses to challenges they have faced in the workplace (the never attainable but always expected “balance” between personal and professional life) I realized that we are not that different. Even women like Jessica Mendoza , two-time Olympic medalist and MLB Analyst for ESPN, and Courtney Conlogue, Professional Surfer and 2018 Vans U.S. Open of Surfing Champion, or Sophie Goldschmidt, the Chief Executive Officer of the World Surf League, wake up every morning and find the motivation that they need to accomplish their goals. They seek out mentors, stay up late at night with sick kids, and face setbacks. Our professional goals are just different. At Words Alive, we create equitable learning opportunities that empower students and families to become the architects of their own education. My professional goals include ensuring that we have the funding we need to do this work every single day. This may not be as cutting edge as leading the first and only US based global sports league (and among the first internationally to achieve prize money equality for male and female athletes) but it is still important work. Words Alive uses reading as a tool to create an environment where participants, volunteers, donors, and community partners come together to develop innovative solutions to educational barriers in the communities we serve. I can now say with confidence that, yes, nonprofit leaders do belong on the stage at events like this and I am so grateful for partners like Farmers Insurance and the Century Club of San Diego for lifting nonprofit organizations up and putting us in the spotlight to share our story. Newer PostWhat Are Wordless Books? Older PostIt's National Mentoring Month!